Judicial Clerk - Honorable James T. Owens, Superior Court. Mr. Werbel began the practice of law by joining an insurance defense firm, where, within 5 years, he was a named partner in the firm. In May of 1972, he and John Methfessel Sr. left and formed the law firm of Methfessel & Werbel. He began his career specializing in the trial of insurance policy defense cases and liability and fire subrogation cases. He honed his expertise in these areas, as well as insurance coverage, and soon was handling or supervising the handling of insurance defense cases that would have a significant impact on the development of New Jersey insurance law. As the result of a highly successful practice spanning over 35 years he is now recognized as one of the leading authorities on first party, coverage and insurance fraud issues in the state. 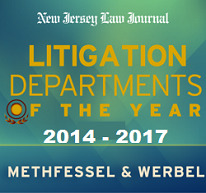 Mr. Werbel has made significant contributions to development of legislative and administrative insurance law as well, having been consulted or called to testify regarding a variety of licensing, coverage, and liability issues before the legislature of the State of New Jersey, as well as the Department of Banking and Insurance. He has been a speaker on numerous insurance topics before the New Jersey Association of Mutual Insurance Companies, the North Jersey Claimsmens’ Association, the Independent Adjustors Association of New Jersey, the New Jersey Defense Association, the Insurance Executives of Hartford, the New England Mutual Insurance Companies’ Convention, the New England Mutual Insurance Claims Executives Association, the New England Mutual Insurance Companies’ Loss Managers Conference, the New Jersey Special Investigators Association, and New Jersey State Association of Mutual Insurance Women, as well as many carriers. He is a member of the New Jersey Defense Association, North Jersey Claimsmens’ Association and attorney to the Independent Adjustors Association of New Jersey.